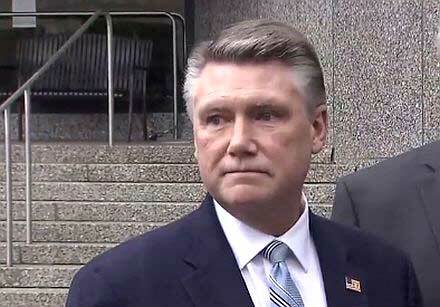 Mark Harris met with state elections investigators Thursday morning, pledging full cooperation with the board in the increasingly complex investigation into alleged ballot fraud in November’s 9th Congressional District race. The same morning, Harris’ lawyers sued the state board of elections , asking the Wake County Superior Court to compel the board’s director to certify the election results before the investigation is complete. As the 116th Congress was sworn in Thursday in Washington, D.C., North Carolina’s 9th Congressional District seat was the only one empty. The new Democratic majority in the House of Representatives has made it clear they will not seat anyone until questions over the legitimacy of the election have been answered. But when those questions will be answered – and by whom – is unclear as a fierce partisan battle continues over the board of elections itself. After a legal battle over its makeup and function, the nine-member board (formerly known as the Bipartisan Board of Elections and Ethics Enforcement) was dissolved by court order last week . The structure of the board, designed by Republican lawmakers, was found to be unconstitutional. A new bill  restructuring the board goes into effect Jan. 31. Gov. Roy Cooper wants to appoint an interim board to deal with the 9th District issue in the meantime. GOP lawmakers, however, have refused to submit names for appointment, leading Cooper to abandon the idea. Parties wishing to be heard in the case will have to file responsive briefs to the Court by 5:00 p.m. on Monday, January 14. No hearing date will be set until next week, when the Superior Court’s regular session begins. At issue: An alleged ballot “harvesting” operation, run by a consultant hired by the Harris campaign, and whether it swayed the narrow 9th District election in Harris’ favor. Harris narrowly bested incumbent Rep. Robert Pittinger  in May’s Republican primary and then appeared to defeat Democrat Dan McCready by just 905 votes  in the November general election. But questionable vote tallies led to questions about the Harris campaign’s ties to McCrae Dowless – a convicted felon, influential political operative and Bladen County elected official state investigators have repeatedly tied to ballot harvesting operations in previous elections. Multiple people have now come forward to say, in interviews and sworn affidavits, that Dowless and his associates paid them to collect masses of absentee ballots in the district. That’s illegal because of concerns of tampering. A close race could be turned by either forging unsealed ballots or simply failing to turn in enough of one candidate’s mail-in ballots to give another a huge advantage among those voting absentee. Harris admits he hired Dowless, who worked closely with Red Dome Group , the political consulting firm to which Harris paid $428,908 for work in the primary and general elections. But Harris said he had no idea that Dowless may have done something illegal and Dowless himself has, through an attorney, denied any of his work broke the law. On Thursday, Harris reiterated to reporters that he didn’t know whether Dowless did anything illegal. Asked whether he would make the decision to hire Red Dome group again, Harris stuck by the company. “I certainly have not seen any reason at this point that I would not hire Red Dome again,” Harris said. Harris said he had no reason to doubt the legitimacy of the election. In the GOP primary, Harris won 96 percent of Bladen County’s mail-in ballots – an extraordinary showing against the Republican incumbent. In the general election Harris took 61 percent of the county’s mail-in absentee vote. Only 19 percent of the mail-in ballots came from registered Republicans. In order for that to happen, Harris would have to have gotten all of the mail-in absentee votes of the 19 percent of registered Republicans, nearly all of the unaffiliated voters who used that method and some of the Democrats who voted that way as well. More than 3,400 of the mail-in absentee ballots requested by voters in the 9th District were reported unreturned, according to the state board of elections. Most of those were in Bladen and Robeson counties and can be tied to precincts with high percentages of minority voters. After November’s election, the North Carolina Republican party pressed the state board to certify the election results, despite mounting questions about its legitimacy. Several prominent Republicans backed off of that position as further revelations about ballot harvesting in the district came to light – particularly once people involved in the operation began coming forward and providing information to investigators. State Senators Tommy Tucker, Dan Bishop and Paul Newton – all Republicans who represent parts of the district in the General Assembly – held a press conference in which they said enough information had come forward that they wouldn’t be comfortable certifying the results. They called for a bipartisan panel to investigate further. But as new revelations have deepened the investigation and a court battle and political tug of war over the elections board itself have prevented a public evidentiary hearing, many of those same Republicans have changed their tune. Criticism of the board and its investigators has intensified and calls to simply certify the election and continue the investigation later have been renewed. By refusing to provide names for appointment to an interim board of elections, Finch said, GOP lawmakers are stretching out the problem until at least the end of the month, when a new board can be appointed under the new configuration. Harris’s lawyer, David Freedman, said despite suing to have the results certified before the investigation is complete, he and the Harris campaign will cooperate fully with the inquiry. The Harris campaign has been under subpoena since Dec. 1 with investigators asking them to produce 140,000 documents related to the campaign. So far, a board spokesman confirmed Thursday, they have produced about 400. McCready, Harris’ Democratic opponent, said in a series of tweets Thursday that the ongoing investigation should be allowed to run its course.